28. Don't defend your resume. The purpose of a job interview -- whether the employer knows it or not -- is for you to demonstrate how you're going to do the job profitably. 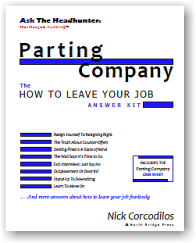 But, the typical interview quickly disintegrates into a discussion about the candidate's resume. Tell me about this company you worked for. What did you do? What does this part mean, exactly? Can you explain this on page two? What made you decide to get this particular degree? Your mission in the interview is not to defend that piece of paper. It's to explain and show how you will use your skills and abilities to help the manager tackle the problems and challenges he's facing in his business. Few managers know how to take an interview past the resume. It's up to you to keep the interview on track. If you don't take control of the interview, you'll lose. Focus on the work to be done. Don't defend your resume. Want to stand out ahead of your competition? Be the most profitable job candidate the employer has ever met. Be ready to control the job interview by showing how you'll contribute to the employer's bottom line. Show up totally prepared! 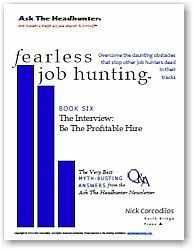 Fearless Job Hunting: Overcome the daunting obstacles that stop other job hunters dead in their tracks!